Latin America and the Caribbean have always occupied a place of unique and singular importance for the United States. For instance, the Panama Canal, the economic embargo of Cuba, NAFTA, preservation of the Amazon rainforests, drug trafficking, etc., are just a few of the many subjects that have consumed the imaginations, the interests, and the energies of U.S. business people, politicians, students and even tourists. In fact, the regions of North, Central, and South America, including the Caribbean, are becoming ever more intertwined culturally, linguistically, economically and politically. For the student interested in issues of bi-lingualism in secondary education, international trade and finance, foreign affairs, diplomatic history, modern foreign languages, etc., knowledge of Latin America and the region’s relationship to the United States is becoming ever more indispensable. The Latin American studies curriculum offers students the opportunity to learn about Latin America from a broad-based interdisciplinary perspective. Students interested in pursuing a course of study at Albright with the primary focus on Latin America have the option of selecting Latin American and Caribbean Studies as an interdisciplinary major. Students wishing to complement a traditional disciplinary focus with a Latin American contextualization can choose to combine Latin American and Caribbean Studies with another major. And finally, students who are pursuing other majors, but who would like to become more familiar with Latin America in a very general way, may choose to participate in the five-course Latin American and Caribbean Studies Minor. The Latin American and Caribbean Studies minor is a five-course curriculum. In either the first or second year of study, students must take the “Introduction to Latin American Studies” course (LAS 225). In the third or fourth year of study, students must take the core “Seminar on Latin America” (LAS 400). Students must also take, at any point in their four years at Albright, three Latin American and/or Caribbean content courses listed across the curriculum. For the minor option only, students are permitted to “double-count” these courses as fulfilling both the Latin American and Caribbean Studies program requirements and either general studies requirements or the particular requirements of any degree program. Latin American and Caribbean studies as a combined major is a seven-course curriculum. Students take the “Introduction to Latin American Studies” course (LAS 225) in their first or second year and then the core “Seminar on Latin America” (LAS 400) in their third or fourth year. Students must also take, at any point in their four years at Albright, five Latin American and/or Caribbean content courses listed across the curriculum. The interdisciplinary major in Latin American and Caribbean Studies is a 12-course curriculum that combines core, track and elective courses. The core requirements are “Introduction to Latin American Studies” (LAS 225), which should be taken within the first two years of academic work at Albright, and the “Senior Seminar in Latin American Studies” (LAS 400), which should be taken in the junior or senior year. After taking Introduction to Latin American Studies (LAS 225), students will declare a primary and secondary track from the two tracks (Group A or Group B). Group A consists of courses that focus more on the arts and humanities, and Group B consists of courses that focus more on the social and natural sciences. The track is an eight- course sequence in which students choose five courses from one group and three courses from the other group to complete the track requirement. Note: The Director may add additional courses to the groups. The major is also required to take two elective courses in Latin American Studies. This course exposes students to various issues that shape the Caribbean region today and strengthens their critical thinking skills as they begin to grasp the commonality and complexity of this region. Topics include status of women, education, democracy and dictatorship, relations with (former) colonial powers, relations with the United States, Caribbean federalism, language and everyday life. Although history is not the focus of the course, its impact on these topics is examined. Satisfies general studies humanities foreign language cultural requirement. Latin American government and society arises out of a tradition of centralized power that is vastly different from that of democratic society in North America. This course provides some insight into the often troubled relationship between the U.S. and its Latin American neighbors. It examines the development of this tradition in some classic statements by D. F. Sarmiento, José MartÌ and Octavio Paz, among others. The bulk of the reading is comprised of literary works that either support or subvert the authoritarian tradition of government and society in Latin America. Emphasis is placed on class discussion analyzing the ways in which the literary works in question tend to support or subvert the portrait of Latin America established at the opening of the semester. Latin music is a rapidly rising phenomenon. This course explores the roots and evolution of Latin musical styles from their origins in the Catholic cultures of southwestern Europe and its mixing with Native American and African cultures in the colonial Americas beginning in the 15th century. The focus is the urban popular musical styles that emerged in the late 19th century, and which developed into the famous regional styles of Argentine tango, Brazilian samba, Cuban son and salsa, Dominican merengue, Mexican rancheros and baladas, and many others over the course of the 20th century. Students will also consider the roles the Latin regions have had in other styles such as jazz, classical music, rock and roll, and rap. Students will assess the varying degrees of success Latin sounds are having in the major world musical markets today. The great Latin American “liberator,” Simón Bolívar, commented that, “The United States seems destined to plague us with miseries in the name of liberty.” This course examines the historical development of the relationship between Latin America and the United States from Latin American independence to the present, concentrating mostly on the 20th century. It examines specific historical examples, including the Spanish-American War, the Panama Canal, the occupation of Haiti, the Cuban Revolution and the drug wars in Colombia. It looks at how this relationship developed in specific historical contexts, such as the Cold War. Students will discuss how the historic relationship and the present day context impact relations between Latin America and the U.S. today. The great civilizations of the Americas flourished centuries before the Spanish arrived (uninvited) to those shores. There were three great regions in Latin America in which cultures developed – in what is today central Mexico, in southern Mexico and northern Central America, and in Peru. The final civilization in each of these regions was the Aztec, Maya, and Inca respectively, yet these empires were built on the foundation of the important civilizations that preceded them. The course is divided into three sections, and in each one of these regions will be discussed. This survey course examines Latin American history from the time of Columbus’ first voyages to the end of the 19th century. The course discusses the contact between and mixtures of diverse peoples in the Americas, especially the pre-Columbian populations, the Spanish and Portuguese, and the Africans brought forcibly to the Americas as slave laborers. It covers period of conquest, the colonial period, the wars of independence and the first decades of nation building in Latin America in order to build a foundation in Latin American history. The course examines political, economic, social and cultural factors and how they played off one another throughout the 400-year period. The readings are a combination of primary texts and scholarly works on Latin American history. Film is used to explore parts of this history. The course format is a combination of lecture and discussion. In the 20th century, Latin American nations experienced cycles of revolutions, democracies and dictatorships. Revolutions have taken the form not only of familiar guerrilla-based insurrections, but also right-wing military coups. This course examines this cycle of revolution, democracy and dictators by looking at several of the key revolutionary movements and some of the long dictatorships that have shaped Latin America during that century. Specifically, it examines the Mexican Revolution (1910 – present), the Cuban Revolution (1959 – present), and the Zapatista struggle (1994-present), and the political situations that preceded or followed these revolutions. It also looks at some of the right-wing coups and populist movements, specifically examining cases in Argentina and Chile. Finally, students discuss if revolution remains a viable way to promote change in Latin America in the 21st century. This course provides an historical overview of political printmaking in Latin America. More specifically, it focuses on the graphic art surrounding the Mexican Revolution, the Cuban revolution and 20th century Brazilian folhetos. Students examine the social and political framework in which these artists lived and worked and explore traditional relief and intaglio processes. As a studio course, it meets six hours per week. This course examines the many religious traditions that co-exist in the diverse region we know as Latin America. Specifically, the course discusses Catholicism, including Liberation Theology, Indigenous religious traditions that have survived and African traditions that have continued to thrive throughout Latin America. The course emphasizes how these traditions often adapted and blended together to form what we know as syncretic traditions. Finally, the course examines the growing influence of Pentacostalism in Latin America. This course addresses environmental topics as they pertain to Latin America and the Caribbean Islands. Topics include deforestation, agriculture, conservation of biodiversity, wetland loss, coral reef degradation, ecotourism and others. Emphasis is placed on merging Latin American and Caribbean culture with environmental management and policy. This course examines the indigenous people of America. It begins with an assessment of who the first Americans were and when they arrived. Controversy surrounds this issue. Students will review the latest findings and hypotheses to develop a thorough understanding of the initial peopling of America. Then, the course examines four different groups who have, and to some extent still do, inhabit different regions of America–the Cree, indigenous populations of Pennsylvania, the Maya and the Yanomamo. Students will gain a better understanding of the heritage and diversity of Native Americans as well as the different effects that the modern world has on the their lives. This Interim course provides Albright College students a first-hand opportunity to study the Spanish-speaking nation of the Dominican Republic from an interdisciplinary perspective. Following three two-hour seminars held during the fall semester preceding the January Interim, students will travel to Samana, Dominican Republic for three weeks to study language and culture. Students may choose to receive interdisciplinary, Spanish, Latin American studies or psychology credit. Students who wish to receive credit in psychology may do so by selecting projects in the discipline in consultation with a faculty member in the field. Students enrolled in this course will observe and experience a cultural system distinct from their own in order to understand the complexity of this system as well as the complexity of their own cultural system. They will also have a better understanding of how human behavior influences and is influenced by perceptions of cultural “norms.” Students will improve in all four areas of second language competency: listening, speaking, reading and writing. To accomplish the aforementioned goals, students will live with Dominican families in the small town of Samana. They will examine the social dynamics of this community beginning in the family unit, and observe and experience daily life in the community. They will also contribute to the community through a variety of service learning projects. 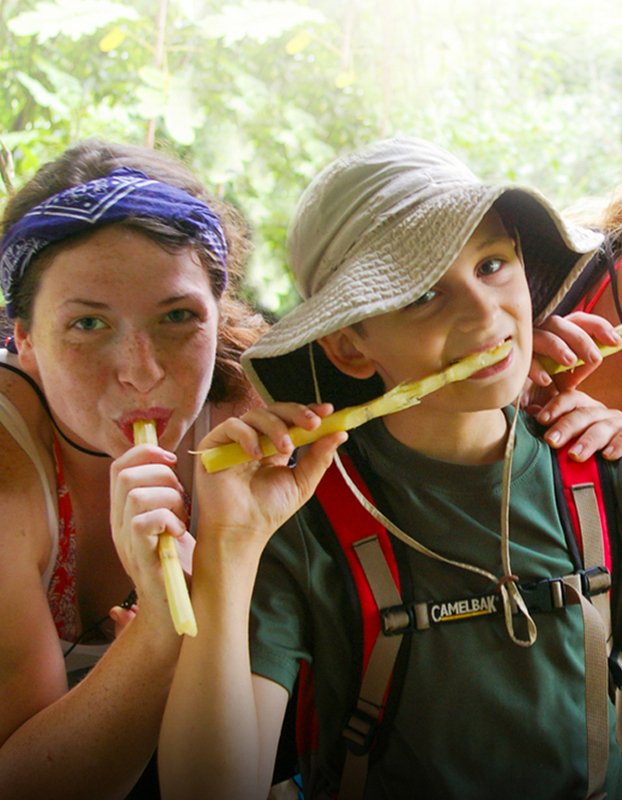 Students will travel to other areas of the island and participate in a number of college-organized excursions. The family, as both a cultural expression and a socio-economic unit, has played a seminal role in the historical development of Latin America. The study of the family is important not only for understanding society, but for understanding the ways in which political and economic power is structured in the region. The course is divided into two parts: part one examines the colonial period and the nineteenth century, and part two the twentieth century. In each section we will discuss different issues that have confronted Latin American families, such as family responses to the challenges of the church and/or the state; how poverty and wealth affect and create different types of families; how race and ethnicity play a role in the family structure; how families help to structure the economic realm of Latin America; how poverty perpetuates family disintigration, and some of the proposals of the Inter-American Development Bank (IDB) to try to mitigate that situation. Finally, we will briefly discuss the issue of migration and family in Latin American and the United States. This Interim course introduces students to the people and lands of the French speaking, Caribbean island of Martinique through an intensive and structured visit to the island. After reading and assessing a series of preparatory articles, students will travel to Martinique with faculty to complete a series of activities that will enlighten them to many aspects of Martinique life. These undertakings include lectures at the university, field trips to various parts of the island and a variety of directed events, which will encourage students to participate in many facets of Martinique culture. This course examines the phenomena of ritual and festival by using case studies from Latin America. It first examines the linkages between religion and society, and then students discuss the symbolic action of ritual in order to learn how to “read” ritual action. Some of the rituals to be examined, in order to understand the themes above, will be the peyote ritual in Northern Mexico; Christmas rituals and Day of the Dead, also in Mexico; the rituals of Vodun and Santeria that are practiced in Haiti and Cuba respectively; the Afro-Brazilian ritual of congado (the devotion to Our Lady of the Rosary); rituals to the ancestors in highland Bolivia; and perhaps others. This course introduces students to the basics of field studies within the Anthropolgogical and Ecological disciplines. The study culminates in student projects focused on a Communal Reserve in the Amazon region in Peru. Specific topics include techniques in biological surveys with emphasis on cataloging species diversity, habitat assessment, quantifying human influence, and evaluating efficacy of wildlife management techniques. Anthropological/Sociological methods include survey and demographic data collection, interviewing, direct observation and participant observation followed by methods of assessment including both qualitative and quantitative analysis. Students will be required to propose and conduct group projects during a 10-day field component in Peru. Now with a significant unit on Latin American organized crime, this course examines criminal activities carried out through criminal organizations and focuses on organized crime as it relates to cultural history, assimilation processes and characteristics of its home societies that have fostered its growth and successes. Trends in organized crime in terms of ethnicity, structure and activities are investigated. This course covers the social, historical, and economic reasons for migration to the United States in recent times as well as the development of older Hispanic communities such as those in the Southwest. The course includes readings of Chicano, Puerto Rican and Cuban literature, the study of Hispanic contributions to North American life and culture, and field trips to agencies in the Reading area that work closely with Hispanics. All readings and discussions are in Spanish. The countries of the Southern Cone of South America, which include Chile, Argentina, Uruguay and Paraguay share many characteristics: they are all located geographically in the Southernmost part of the Western Hemisphere; they have been somewhat removed from contemporary global balance-of-power rivalries; for the most part they have fairly homogenous societies (Paraguay is the one exception to this); they generally have more developed economies; and they have all experienced harsh dictatorships followed by democratic transitions. But these countries also have features which distinguish them as well. This course explores the many aspects of contemporary life and culture in these Southern Cone countries and introduces students to a part of Latin America that often gets overlooked. Readings and lectures are conducted in Spanish. Satisfies Spanish concentration requirement. This course focuses on the Andean nations: Columbia, Ecuador, Peru, Bolivia. Topics include the geographic setting of desert highlands and jungle; the Inca culture and its legacy; Inca and Spanish cultures in contact; social problems and social protest; transitions from dictatorship to democracy; writers and artists from the pre-Columbian era to the present who reflect the Andean experience. Readings and lectures are in Spanish. Satisfies Spanish concentration requirement. This course will introduce students to the history of “Mexico.” The quotations are there for a reason. The Mexico we think of now has only existed since the 1820s, as a bureaucratic and administrative space. This course is a study of not only of Mexico as a country and state, but the formation of Mexico as an idea. Beginning in the pre-Columbian, the course will move to the colonial era, and close into modern day events in Mexico. Some of the events we will focus on will be life as a colony, connections to Asia, the turbulent 1800s, the Mexican Revolution, relations with the US, etc. The purpose will be to build not only an understanding of Mexico, but of the nation’s place within Latin America and the Globe. This course follows the history of women and gender ideologies in Latin America from the beginning of the colonial period up to the present. In the first half of the course, the colonial period, students discuss European gender expectations in Latin America, and look at the responses to those expected roles that many women took: mother, lover, nun, wife, widow, plantation owner and adventurer. The course looks at the very different experiences of and standards for non-European women in the Americas. The second half of the course looks at women in Latin America from the mid-19th century up to the present, again exploring different roles those women assumed, such as workers, suffragettes, artists, politicians and revolutionaries. The course also looks at gender ideologies such as patriarchy, machismo and marianismo, and how they impacted both men and women. Throughout the course students examine both extraordinary and ordinary women and discuss the diverse roles they have played in the history of Latin America through the reading of texts, primary accounts, the viewing of films and documentaries, and discussion. Many world problems emerge in Latin America—high infant mortality, drugs, hunger, population growth without jobs, economic stagnation, the debt crisis, foreign aid, trade and outside intervention. This course is about the origins of traditional and contemporary political problems and potential remedies for these problems. Students are encouraged to do the assigned reading with a view to offering their own analyses and possible solutions. A majority of the persons who migrated to the Americas before 1800 came from Africa. Very few of them came willingly, but without their economic and cultural contributions the world we know today would not have come into being. The goal of this course is to begin to understand the experiences and achievements of these Africans and their descendants in four regions of the Atlantic world – Africa itself, Brazil, the West Indies and the Chesapeake – between the mid-15th century and the revolutionary struggle for Haitian independence at the beginning of the 19th. This Interim course provides students a firsthand opportunity to study the Spanish-speaking nation of the Dominican Republic from an interdisciplinary perspective. Following three, two-hour seminars held during the fall semester preceding the January Interim, students will travel to Samaná, Dominican Republic for three weeks to study language and culture. Students may choose to receive credit in interdisciplinary studies, Spanish, Latin American studies or psychology. Students who wish to receive credit in psychology may do so by selecting projects in the discipline in consultation with a faculty member in the field. This advanced level course takes an in-depth look at Latin America from an interdisciplinary perspective. The purpose of this course is twofold: Students are exposed to interdisciplinary methodologies and will learn in the process how to synthesize effectively multiple disciplines around common themes; and they will then review current trends and research directions on Latin America from a variety of disciplines (politics, economics, history, society and culture) and, in a major seminar research project, will apply an interdisciplinary methodology to this material in order to gain a broader, more holistic understanding of the region. An exploration of the Yucatan Peninsula as experienced by the ancient and modern Maya. This Interim course will begin with a series of lecture experiences followed by a tour of the Yucatan’s significant archaeological sites and natural areas. The tour will be organized by a professional archaeologist and include lectures by specialists in local flora and fauna, natural medicine and ecology. Upon return to campus, the course will conclude with additional lectures and presentations of students’ research projects. What Can I do With a Major in Latin America Studies?